“Prodigal Pups” from Christian Faith Publishing author Traci Pate is both entertaining and delightful; it is about loss and finding one’s path toward loving and caring arms. “Prodigal Pups”: a tale of friendship, compassion, and love shown by animals with human personalities. 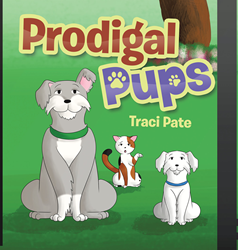 “Prodigal Pups” is the creation of published author, Traci Pate, a loving wife, mother, and grandmother residing in Tennessee. Published by Christian Faith Publishing, Traci Pate’s new book is the enthralling journey of two young canines experiencing fun and excitement while away from home. Gus and Spud are two mischievous pups who yearned for adventure beyond the fence. Follow their moments of finding their way back home after getting lost in the fun. View a synopsis of “Prodigal Pups” on YouTube. Consumers can purchase “Prodigal Pups” at traditional brick & mortar bookstores, or online at Amazon.com, Apple iTunes store, or Barnes and Noble. For additional information or inquiries about “Prodigal Pups”, contact the Christian Faith Publishing media department at 866-554-0919.